Brick And Mortar Stores Go Further To Get You In The Door While online shopping grows, traditional retailers are amping up their in-store experiences to draw in customers. But online stores are realizing they have something to gain from physical stores too. 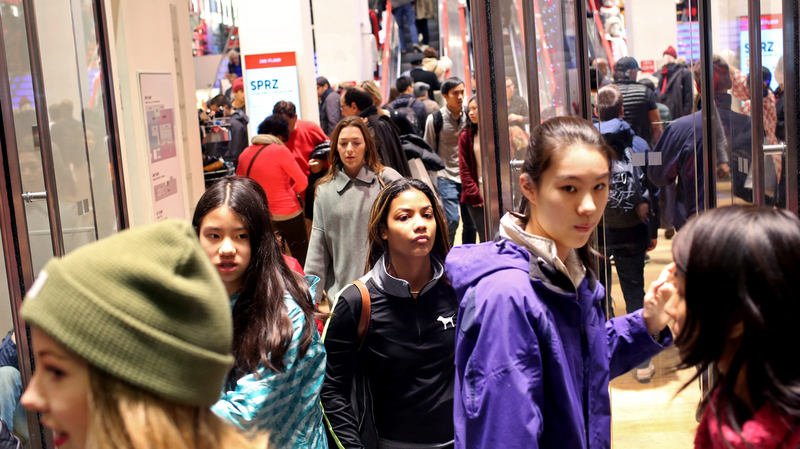 Shoppers walk out of Uniqlo on Fifth Avenue in New York City on Black Friday, Nov. 27. The weekend after Christmas has typically been big business for retailers, as people return gifts — and buy new ones for themselves. But some brick-and-mortar retailers are struggling this holiday season, facing the dual problems of overexpansion and an increasingly demanding consumer base that likes the ability to shop online. Stores like Radio Shack, Office Depot, Staples, American Apparel and even Target have announced store closings or bankruptcies over the past year. As shoppers embrace the convenience of shopping online, traditional retailers have slashed prices and staged blowout sales in an effort just to get people in the door. Brick-and-mortar stores are trying to compete by offering an experience that can't be matched online. "Having a special event at the store ... they have coffee bars ... they have couches, TVs. The retailers are trying to sort of make the shopping at their stores into an experience, to give you a reason to visit," says Suzanne Kapner, who covers retail for The Wall Street Journal. Getting people in the door is especially important this time of year, as sales in the holiday season, from Nov. 1 to Dec. 31, usually account for up to 20 to 40 percent of retailers' annual sales, according to the National Retail Federation. Meanwhile, brick-and-mortar shops have also embraced e-commerce themselves — like Wal-Mart and Target, two traditional retailers that also make lots of sales online. But that creates challenges of its own. Staffing these warehouses and distribution centers for online sales requires extra workers, especially during holidays, and employers are having more difficulty filling those jobs in recent years. Wal-Mart and Target have both been building new distribution centers and hiring more people to deal with the increased online demand, according to the Wall Street Journal. "Retailers are scrambling to find employees to fill their warehouse," Kapner says, "and they've been cutting back on the number of employees on the store floor." Black Friday, the day after Thanksgiving, has traditionally been the biggest retail shopping day of the year. But data from the National Retail Federation say more than 103 million people shopped online over the Thanksgiving weekend, edging out the fewer than 102 million who said they shopped in brick-and-mortar stores. The day after Christmas, on the other hand, ranks as the third biggest day of the year for the number of store visits, according to ShopperTrak, a research firm. When ranking for sales, though, Dec. 26 falls to 10th place, far below Black Friday, because of the large number of people entering stores to return items rather than buy them. As customers move to shop online and have greater ability to shop whenever, wherever, single days like Black Friday are becoming less important, argues Jesse Tron of the International Council of Shopping Centers. "There's an overall dilution when it comes to this entire shopping weekend," Tron told NBC News in November. "On Black Friday, the crowds at stores were noticeably thinner," says the WSJ's Kapner. Others argue that Black Friday and that whole weekend are becoming more important — at least online. "Thanksgiving has established itself as one of the more important online buying days, while Black Friday continues to gain in importance online with each passing year," said Gian Fulgoni, in a report from comScore Inc., as reported by Bloomberg. Sales on Thanksgiving rose 9 percent and sales on Black Friday rose 10 percent among people using desktop computers, according to comScore. And this year's Cyber Monday, the Monday after Thanksgiving, was the biggest ever, with online sales of more than $3 billion, according to the company's report. Compounding the threat of online business was a too-rapid expansion of retail locations in recent years. Stores like the Gap and Macy's announced closures for dozens of locations in 2015. "Over the past decade or two you've just seen these chains open dozens and dozens of stores and they've just frankly overexpanded. We have too many stores in this country," Kapner says. "By one count there's something like 23 square feet of gross leasable space for every person in the country." But brick-and-mortar isn't completely done for. In fact, several e-commerce-only companies have opened physical stores for the first time. Amazon opened its first permanent store in Seattle in November. Some online sellers say customers want to have a physical experience. Warby Parker, an online eyeglasses store, now has brick-and-mortar stores in several states around the country. "There's still something tangible that you can't replace, when you're walking into a store, engaging all five senses," Warby Parker CEO Dave Gilboa told NPR's Elise Hu. Physical stores aren't going away anytime soon, but the ongoing struggle between brick-and-mortar and e-commerce is good for the rest of us, Kapner says. "Consumers are really the big winners here because they have all the options now," she says.